Apologies for my absence. Some of you may be aware that England has been getting a bit of a battering weather-wise. Storm after storm has hit southern Britain giving us almost biblical amounts of rain. It’s felt like it has poured virtually non-stop since December. We’ve had the wettest January since records began. February has been much the same leaving most of Somerset under water. A tributary of the River Avon that normally trickles through the end of my garden has been raging through like a torrent, often only inches from the top of the bank. It’s running at its highest level for over 30 years. The garden has at times resembled a large pond, complete with ducks, the result of the rising ground water. Unfortunately this came through the wall, partially flooding the kitchen and leaving us with no telephone and broadband for over 6 weeks which I hope explains the dearth of posts. On Friday night I received yet another flood warning from the Environment Agency so once again we moved what we could upstairs. Fortunately the river level dropped overnight so on Saturday morning I was able to meet up with a few of the Bulford Conservation Group on Salisbury Plain to survey for the eggs of the Brown Hairstreak butterfly Thecla betulae. The eggs are almost exclusively laid on young blackthorn, often no more than a metre above the ground. Sites that are exposed to the sun yet protected from the wind are preferred and the white eggs are usually found at the base of where one-year-old wood branches out from a two-year-old stem and stand out well against the dark bark. Yet despite searching large tracts of promising sloe in the vicinity of ash and getting one or two vicious scratches to prove it I personally didn’t find any. Then as the sky darkened signalling the return of the wet stuff and suggesting it was time to make a move, or at least spray myself with WD40, Laura finally spotted one (see photo above) and soon the more experienced found a further six. Later a further four were found giving us a total of eleven for the day. 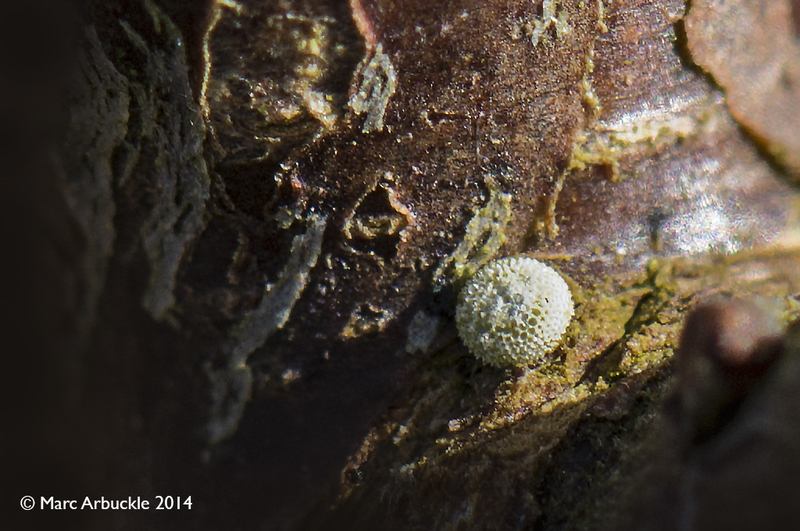 The egg really is tiny, about 1.5mm, but when enlarged the intricate pattern reminds me of a delicate sea urchin. Sadly the eggs are often destroyed by over zealous hedge-trimming.